The exhibition Preston Singletary: Echoes, Fire, and Shadows opened at the George Gustav Heye Center (NMAI) in New York City on March 19, 2011 and continues through September 5, 2011. Echoes, Fire, and Shadows is an impressive mid-career survey of the oeuvre of Seattle-based glass artist with Native American (Tlingit) roots, Preston Singletary (b. 1963) . Despite his achievement of international recognition for his stylized, nature-based form-line designs in blown, cast and etched glass, the exhibition at the National Museum of the American Indian (NMAI) will be the first in-depth presentation of Singletary’s work in New York. Organized by the Museum of Glass and co-sponsored by Alaska Airlines and several charitable foundations, the exhibition opened at the Museum of Glass in Tacoma in July, 2009 and traveled to the Heard Museum in Phoenix in October, 2010. The presentation at the NMAI features 52 works illustrating Singletary’s artistic evolution over the past two-and-a-half decades. 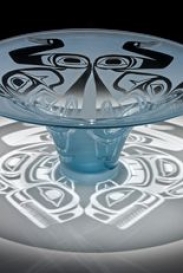 Although pride-of-place is given to Singletary’s better-known glass sculptures, which combine indigenous Northwest Coast woodcarving traditions with studio-derived glass working techniques, a dozen notable pieces from early in his career are displayed in the rear. Curated by Melissa G. Post of the Museum of Glass, an institution formerly focused on the work of Dale Chihuly and expanded to include contemporary and Pacific Northwest glass art generally, the exhibition adopts a biographical approach to the presentation and interpretation of Singletary’s work; it traces his artistic development backwards over a span of 26 years. Occupying the entirety of the Heye Center’s three spacious contemporary galleries, the progression moves visitors from the most industrious and visually striking of Singletary’s Native-inspired sculptures, to the smallest, most subordinate European-derived vases and vessels. Through a series of wall texts and object labels, visitors are instructed on the gradual development of Singletary’s current distinctive style through successive encounters with prominent mentors and collaborators, “interspersed with periods of deep introspection and cultural inquiry.” Tempering the curatorial narration, a number of one-line quotations bring Singletary’s interpretive voice into the space, blown-up and stenciled directly onto the walls. Accordingly, the exhibition sets itself at a great distance from the legacies of anthropology and from the early settings for the display of Northwest Coast Indian art, such as natural history and anthropological collections. Forswearing the compulsory contextualization characteristic of those displays, which have been criticized for representing indigenous art as products of static and outmoded cultures, the exhibition’s designers assumed the currently ubiquitous installation model popularized by the Museum of Modern Art. In particular, Singletary’s sculptures are displayed on waist-high pedestals, isolated one or two to a case, under glass vitrines and either spot-lit from above or illuminated from within by an invisible light source. Gallery walls are painted in solid, neutral colors and object labels are characteristically terse and discrete. And in spite of the fact that many of Singletary’s sculptures derive from specific, studied examples of Native Northwest Coast artifacts, alluded to here and there in the label copy, no such historical pieces (of which the NMAI owns more than a few) have been included in the show. However, while the curatorial imperative to disassociate the current presentation of art by a contemporary Native artist from the legacy of previous anthropological framings of Native art is highly sympathetic, the utter denial of that legacy within the space of the exhibition presents its own set of problematics. For instance, a prominent feature of the exhibition rhetoric, linked to the biographical approach associated with the personality of the artist, concerns Singletary’s journey from “faithful reproduction” of Tlingit designs to improvisation and abstraction, “gradually developing his own artistic voice and cultivating the seeds of his own personal artistic ethos,” embodied by his achievement of a distinctive, recognizable style . This narrative, essentially the classic, modernist tale of innovation through the hand of an inspired master, is introduced in the introductory text panel and reinforced through the progression of artworks. In the first gallery, for example, representing the current apogee of Singletary’s career, a major highlight is a monumental work titled Clan House (2008), commissioned by the Museum of Glass and revealed at the opening in Tacoma (fig. 1). Composed of eight glass panels arranged to resemble a Tlingit house screen, flanked by two 530-pound carved glass plates referencing house posts, the impressive, wall-sized installation is Singletary’s largest glass sculpture to date. Arranged as a triptych, the work evokes the interior of a Tlingit longhouse, in which a screen of cedar planks girded by two carved house posts would delineate the private dwelling of the chief and his family. According to the object label it is Singletary’s “most ambitious and significant work to date,” a paean of individuated expression and a technical feat. In his early works, such as Whaler’s Hat (2003), Singletary faithfully reproduced traditional designs (fig 2). But as his mastery of the form-line tradition—both with respect to its formal visual language and its cultural meaning—developed, Singletary began improvising and creating his own vocabulary. Thus, what began as a single silhouette of a wolf, one of Singletary’s own clan crests, in an early, traditionally-rendered crest hat entitled Wolf Hat (1989), evolved into a series of bears, killer whales, and frogs in subsequent hats, “each one more elaborate than the next,” until eventually, his Tlingit-inspired designs became stylized or wholly abstract, as seen in Shadow Catcher (2002), his most recent addition to the series (fig 3). Moreover, in this way, the Tlingit crest hat became Singletary’s first “signature form,” clearly indebted to the traditional archetype woven from spruce roots and painted with anthropomorphic designs unique to the wearer’s clan, yet entirely unique and decidedly modern, notably larger than their historical antecedents and engraved in a modern material using the technique of sand carving. 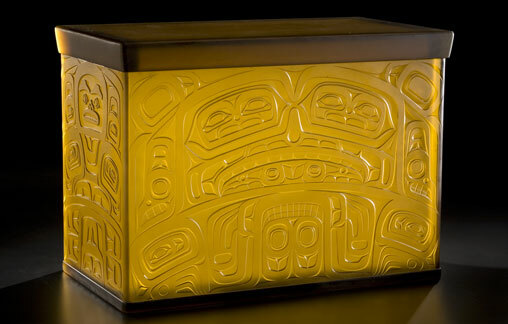 Two final pieces worth mentioning in connection with the narrative of Singletary’s artistic progression toward the status of Native master artist are Never Twice the Same (Tlingit Storage Box) (2003) and Bentwood Box (2006) (figs 4 and 5). In these works, made of single units of cast glass and displayed prominently under separate vitrines in the middle of the second gallery, Singletary was inspired by traditional Tlingit storage chests and boxes, elaborately carved containers used to store formal garments, regalia, and more ordinary objects. Significantly, as noted by Northwest Coast Indian art expert David W. Penny, the images that appear on storage chests and smaller boxes are not crests, but abstract images of more generic animals that are often difficult to identify (fig. 7). This is noteworthy because it feeds into the curatorial argument regarding Singletary’s daring progression into abstraction, and into progressively larger (and therefore more challenging) sculptures. Indeed, beyond its formal reinterpretation of the traditional cedar boxes used by the Tlingit peoples, Never Twice the Same constitutes a significant departure for Singletary, “moving away from representation and towards abstraction.” In addition, the box was also “his first attempt to create work on a distinctly larger scale,” and was followed by even larges boxes, including Bentwood Box mentioned above. Thus, in his storage box series as much as in his signature crest hats, the value and significance of Singletary’s sculptures is measured according to modernist criteria that privilege a certain equation of new invention and unique aesthetic value with authenticity and greatness. While it is beyond the scope of this essay to undertake a critique of such conceits, and the confidence in the certitude of progress that underpins them, I do wish to point out a major problem that this Western discourse on originality poses within the limited context of contemporary Native American art. Though the problem may not be easily recognized at first, it is easier to appreciate if we undo the effacement of history enacted in Echoes, Fire, and Shadows and reinstate the parallel histories of art history and anthropology of the Pacific Northwest Coast. To do so would show that for a very long time, for Western art historians as for anthropologists, what Native Northwest Coast artists were producing was not integrated into the domain of art, but into that of tribal history. Since that time, Western scholars have grappled with attempts to locate the individual native artist. Since the 1950s in particular, both art historians and anthropologists have made efforts “to reconcile modernist criteria for the identification of individual great artists and their unique masterworks” with both actual native art practice, and with the absence of information about Native artists resulting from so many hasty ‘acquisitions’ during the museum age of anthropology, when a salvage mentality drove a rush to preserve Native objects for future study. This process of reconciliation, if that is what it is, has been affected largely through the identification of the unique styles of individuals and of masterpieces that can be attributed to their hand. This practice began in the field of African art and spread to the disciplinary practices of other fields of indigenous art history. According to art historian and artist Judith Ostrowitz, it was not until the 1980s that the practice of identifying individual Native master artists spread to the field of Native American art, with Bill Holms publishing the first study isolating the unique hands of several arts of native North American descent in 1983. However, it was not until as late as 1987 that Steven Brown first “isolated the unique hands of several outstanding Tlingit carvers, including one he has called the ‘Fort Wrangell Master’.” Significantly, these non-native interventions have been motivated by the desire to further distinguish Native tradition, but according to the criteria of others. However, as Ostrowitz has argued, while this “sympathetic application of the European art historical project to non-western art” might be useful in establishing discrete markets for non-western art, and for the development of connoisseurship in academic work, it may not serve us well enough, and least of all contemporary Native artists. For, in the cases of the many contemporary Native artists who live and work on the Pacific Northwest Coast, and who choose to work within the stylistic parameters of their indigenous tradition, producing replicas of traditional designs for contemporary ceremonial use or for the art market, the curatorial mantra that enshrines originality and innovation as requirements for the attainment of the highest levels of professional success and mastery, does these artists a profound disservice. Consequently, these individuals, who are generally encouraged by the art market and by non-native scholarship that identifies them by means of their heritage, are nonetheless excluded from contemporary art discourse and the international centers of cultural power. They may be conceived of as derivative, or “they may be imagined as being discontinuous with cultural dialog,” but the fact remains that whether they produce such works for contemporary ceremonial life or for the enrichment of West Coast art dealers, the significance of their practice cannot and should not be written off as mere conservatism. In the final analysis then, while it is essential that today’s art museums, particularly those engaged in the collection and/or display of indigenous and non-Western art, continue in their efforts to produce comprehensive exhibitions aimed at exposing the oeuvre of Native American artists to a broad public, it is equally important that the curators and exhibition designers charged with the task critically re-consider the grounds on which they choose to make their arguments for art historical significance. For in championing the work of the relatively few artists whose work, in conforming to modernist demands for unique artistic genius arrived at through innovation in form or style, functions favorably within the individualistic criteria established by Western art curators, we run the risk of implicitly condemning the majority to invisibility and irrelevance, denying them their long over-due contemporaneity and perpetuating some of the more pernicious cycles of the world art-system. Holm, Bill. Smoky-Top: The Art and Times of Willie Seaweed. Seattle: University of Washington Press: 1983. Ostrowitz, Judith. “False Cognates: Looking Backward at the Latest Thing in Contemporary Northwest Coast Art.” Privileging the Past: Reconstructing History in Northwest Coast Art. Seattle, WA: University of Washington Press, 1999. Penny, David. North American Indian Art. New York: Thames & Hudson, 2004. Post, Melissa G. “Preston Singletary: Navigating Culture and Glass,” Preston Singletary: Echoes, Fire, and Shadows. Seattle: University of Washington Press, 2009. Press Release. “Survey of Native Glass Artist Preston Singletary Opens March 19 at National Museum of the American Indian in New York.” newsdesk.si.edu/releases/survey-native-glass-artist-preston-singletary-opens-march-19-national-museum-american-india (accessed 4.10.11).